International Marketing Research is widely regarded as the definitive textbook in its field. 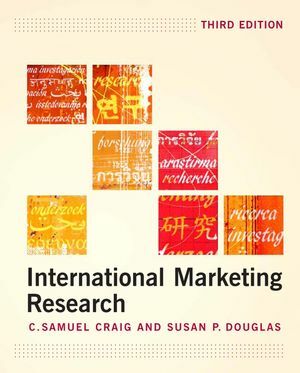 The third edition is completely updated to reflect changes in both the structure and practice of international marketing research in the last five years. As business is being increasingly conducted on a global scale, the need for valid and reliable information to make decisions is intensifying. Industry consolidation of research firms has accelerated as they strive to serve global clients more efficiently. The Internet has burst on to the scene as an alternative way to gather information and conduct surveys rapidly. The third edition has incorporated these developments while adhering to the underlying principles that guided the previous two editions, namely that the basic principles of marketing research are the same whether research is conducted in an international or a domestic context. However, the international marketing researcher faces greater difficulties than his or her domestic counterpart. These difficulties stem from operating across national boundaries and in a diverse range of socio-cultural environments. C. Samuel Craig is the Catherine and Peter Kellner Professor and Professor of Marketing and International Business at New York University’s Stern School of Business. He received his Ph.D. from the Ohio State University. Prior to joining New York University, Professor Craig taught at Cornell University. Susan P. Douglas is the Paganelli-Bull Professor of Marketing and International Business at New York University’s Stern School of Business. She received her Ph.D from the University of Pennsylvania. Prior to joining New York University, Professor Douglas taught at centre HEC, Jouy-en-Josas, France and was a faculty member of the European Institute for Advanced Studies in Management in Brussels. 1. Marketing Research in a Global Environment. Importance of Research for International Marketing Decisions. Issues in International Marketing Research. 2. Designing International Marketing Research. The International Marketing Research Plan. The International Marketing Research Process. Structuring the Unit of Analysis. Issues in Administering International Marketing Research. 4. Uses of Secondary Data. 5. Structuring Primary Data Collection. Defining the Unit of Analysis. Cultural Bias in Research Design, Communication and Interpretation. 6. Establishing the Comparability of Multicountry Data. Establishing Comparability: The Emic/Etic Dilemma. 7. Nonsurvey Data Collection Techniques. Questionnaire Design and Question Formulation. Potential Sources of Bias Associated with the Research Instrument. 9. Sampling and Data Collection. Field Staff Organization and Training. General Issues in Scale Development. Using Multi-item Scales in Cross-cultural Research. 11. Analysis of Multicountry Data. Assessing the Differences in the Level of Variables between Countries. 12. Assessing Differences in the Structure of Variables. 13. The International Marketing Information System. Information Components of the International Marketing System. Data Collection and Processing for the International Marketing Information System. 14. Challenges Facing International Marketing Research. Coping with Change: Marketing Infrastructure and Technology. Contending with Complexity: Conducting Research in Emerging Markets. Confronting Competition: Marketing Research Services in a Global Environment. Conforming to Conscience: Ethics in International Marketing Research. 15. Future Directions in International Marketing Research. Improving Analysis of Cross-cultural Data. The Growth of Internet Research. The previous editions were widely viewed as the definitive texts in the field, no other marketing research book covers the same material. Since the second edition was published there have been rapid and dramatic changes in the field that are thoroughly explored in the new edition. Material on the conceptual foundations of international marketing research has been expanded and now consists of two chapters, 5 and 6. All references to secondary data sources have been updated. New information on the size of the market research industry and the costs of conducting marketing research has been incorporated. More web and internet references have been added. All chapters have been updated incorporating the latest research. New and current examples have been added through out. A complete guide to modern international marketing research techniques by two pioneers in the field. Authoritative coverage of all the latest electronic research techniques.